The food you buy, the packaging it comes in and how far it travels, all influence the energy used in producing food for your table. The main metric used in evaluating the energy used in food production is its Energy Output / Input Ratio. This is the food energy produced (kJ/kg) divided by the fossil fuel and electric energy used per kg to produce the food (Tractor power, sprays, fertilizer, transport, etc). For crops, more energy is produced than used, due to most of their energy coming from the sun. The food input energy is often referred to as its carbon footprint. A vegan diet has a low carbon footprint, a vegetarian has a medium footprint while a meat diet has the greatest carbon footprint, due to the inefficiencies involved in the conversion of grass and cereals into meat. Since our bodies needs both energy (from carbohydrates) and protein (from pulses, vegetables, milk products and meat), vegans and vegetarians need to ensure they eat sufficient protein to stay healthy. People in the UK who eat meat usually have an excess of protein. Since livestock is often the only way of utilising grass in hill pastures, it makes sense to utilise this resource. To achieve both a healthy and a low carbon footprint diet, we should eat meat in small quantities, using its strong taste to enhance the flavour of food. Low meat content dishes like pasta, pizzas, vegetable stews, pies, soups, home-made sandwiches, all accompanied with vegetables, salad and potatoes or pasta make for a balanced diet. 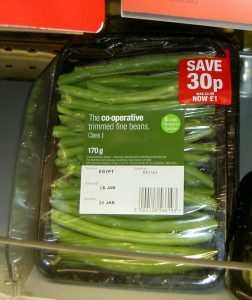 The food industry is very clever at delivering products that maximise the income it can extract from you the shopper. Some of this has a benefit for you; some has little or none. Quick-cook dried foods such as rice, pasta, dried fruit, etc. By having higher levels of moisture in these products, they cook quicker. Items like prunes or apricots need enhanced plastic packaging to preserve them at high moisture contents. Boil in the bag rice is sold in nylon bags which are not recyclable. These high moisture products mean you are paying extra for added water. Pre-prepared foods like lasagne, shepherd’s pie, Indian dishes, are made to a price. Salt and additives with e-numbers enhance the taste of often low-quality meats and extend shelf life. In addition, the container may not be recyclable. While convenient for occasional use, buying basic ingredients without the salt and e-numbers, will give better value and a better diet. Nowadays in supermarkets, almost everything is wrapped in plastic. This allows rapid filling of trollies, extends food shelf life, prevents customers “cherry picking” individual pieces of fruit or veg., and protects delicate items from being damaged on the way home. The only way to avoid excessive packaging is to avoid multi wrapped packs. 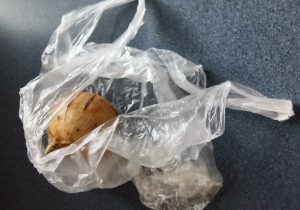 Where items like fruit, vegetables, bakeries are sold unpackaged, they generally require customers to fill a flimsy plastic bag or window-paper bag, which are neither recyclable nor compostable. There is therefore little advantage in buying unpackaged items. By avoiding multipacks, such as individual juice cartons, separately wrapped sweets, etc, packaging waste will be minimised. In Aberdeen’s Materials Reclamation Facility (MRF), Tetra Pak cartons are sent for “recovery” (i.e. burning) in Scandinavia, so these are not very environmental. The big user of packaging is carbonated drinks and beers. If you avoid these, the contents of your recycling bin will be kept to a minimum and your waistline preserved. Getting milk delivered in glass bottles will also shrink your recycling bin contents, but at a cost. Our milk costs £1.44 a pint compared to £ 0.50 a pint at the supermarket. Where possible choose paper packaging over plastic, such as in egg boxes, as they can either be recycled or composted. Flimsy clear-polystyrene boxes for croissants, meringues, are not recycled. Over time foods become invaded with moulds and bacteria that produce toxins, which are harmful to us. They can cause anything from vomiting and diarrhoea to food poisoning. The rate of growth of these organisms is a time-temperature relationship. The higher the temperature and the longer the time, the more infection there will be. Foods remain safe to eat for longer at 5°C fridge temperature than at room temperatures. At freezer temperatures of -18 °C, decay is stopped altogether. To minimise waste, foods are usually best stored chilled in the fridge, or frozen in the freezer. Food left over from meals can be put in plastic containers with lids or bags and put in the freezer. The food is best stored in usable portions, so that only the required amount needs to be warmed prior to use. While fridges keep food cool, they also dry out the air surrounding the food. Ham left uncovered on a plate will dry and curl. Keeping refrigerated food in containers or sealed dishes prevents food drying out. Food now usually comes with “best before” dates on the packages. These are approximate recommendations as to when food should be eaten. A degree of judgement can be used to assess whether the food is safe to eat. Most care needs to be taken with meats, fish, cheeses, soups and half used cans or pots of meat and yogurts. Food producers must err on the safe side, so food may still be suitable to eat after the “BB” date. In choosing to eat items after the “BB date, you should check the contents. Smell of meat is one indicator of decay. Slime between the meat and package is another. Meat, soups, yoghurts, etc showing signs of pustules (circles) of moulds should not be eaten. Moulds on cheese can be cut away but remove some of the good cheese surrounding the mould, to ensure all the mould has been removed. Bread and dry goods will lose their freshness but usually can still be eaten. Their taste may be impaired. If the bread is damp, pin mould may develop, so items affected should be discarded. Fruit, vegetables and meat in boxes or trays sealed with film are best left unopened until ready to be eaten. They usually have a modified internal atmosphere to extend their shelf life. Try to keep as empty a fridge as possible to prevent UFOs (Unidentifiable festering objects) lurking behind other items. Unopened cans, pots, jars, and oven ready or microwave meals will all end up in landfill if put in any residual waste bin. If you have a caddy bin, open the food container and put the contents in it. The can, tub or jar can then be recycled. Don’t empty the contents into garden composters unless these are completely vermin proof. Do you need beans from Egypt out of season?